Six young representatives from the Academy had the pleasure of attending a reception hosted by the Parramatta City Council on 25 February at St Patrick’s Cathedral in Parramatta prior to the Council meeting that evening. 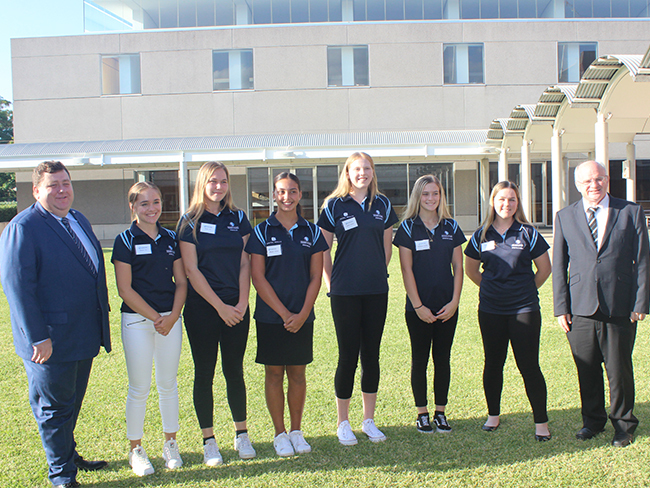 The talented local athlete representatives included, Alessia Haberecht (AFL), Charli Fidler (Netball), Libby Fitzhenry (Softball), Mikeeli Lake (Netball), Samantha Beatty (Cycling) and Zenae Powell (AFL). The Academy provides athlete’s within their programs technical and educational development opportunities, which combined provide a holistic program that is delivered at some of the region’s best venues. “The Academy’s purpose is also to assist athletes in their personal development, and being able to offer them the opportunity to attend Council receptions is an essential part of their development within the program” Academy CEO Marin Bullock commented. The reception provided athletes with the opportunity to converse with Councillors in a social setting to discuss their achievements and sporting careers. The Lord Mayor Andrew Wilson acknowledged the Academy’s athletes and their success at the commencement of the Council meeting. Thank you to the athletes who attended for their fantastic efforts in representing the Academy.